There are dozens and dozens of ways that I make stuffed peppers. Since peppers tend to come in droves either during the farm season or in the seconds bin at the health food store, I tend to accumulate them. Not just green peppers but the colored ones too. Stuffed peppers appeal to the Queen of the Leftovers because they adapt to a variety of ingredients. So I found myself with a little ground beef and some already cooked bulgur and put together a mixture that also included onions, dried currants, toasted pine nuts and parsley. Parboil halved and cored peppers until softening but still crisp. It’s important not to overcook them, since that’s what gives stuffed peppers an odor, a slimy texture and a bad name. These were halved crosswise because of their proportions but lengthwise is more typical of my repertoire. Mix together grains, pre-cooked meat, seasonings etc. Add a lightly beaten egg if it seems that the mix won’t hold together. I usually skip the egg but this mixture needed the help. 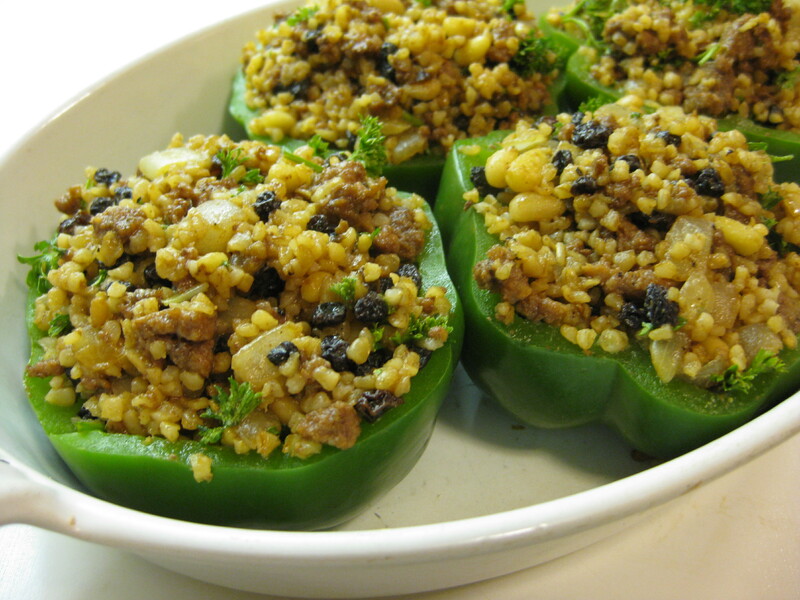 Loosely stuff into the pepper shells and bake in a 350-degree oven for about 25-30 minutes. I served it with braised carrots for contrast. I make a good stuffed pepper too.